Imangi Studios' Temple Run has been played 10 billion times since launch last year. I haven't played Temple Run, but apparently I'm in the minority. The treasure-seeking chase game from Imangi Studios - launched only last year - has been downloaded more than 100 million times, and played 10 billion times since launch. This means players have spent a combined total of 54,000 years collecting loot and trying not to be eaten by demonic monkeys. Not being eaten by monkeys is a noble goal, but 54,000 years? That's a lot of monkeys! 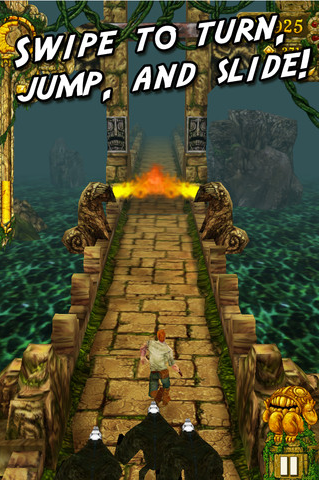 Temple Run was originally a $0.99 release, but soon went freemium. "We never imagined that the game we were making and loved would be so well received around the world," said studio co-founder Keith Shepherd, "the last year has been incredible for us, and we are grateful to fans of the game. We hope to be able to provide them with more entertainment from the brand for years to come." Entertainment, and also merch. All kinds of Temple Run goodies are in the works; apart from the recent Disney Temple Run:Brave partnership there's talk of digital comics, card and board games, arcade machines and even sleepwear. Bear in mind, this all springs from an app that was put together by three people in Raleigh, N.C. - Keith, his wife Natalia, and artist Kiril Tchangov - and which now keeps their studio afloat, among other things. I'm guessing they may also have paid off their mortgage, with that kind of monetization. Temple Run is available for iOS and Android devices, and the iOS version has recently been updated. To celebrate this milestone, all of Imangi Studios' games released prior to Temple Run are available for free download for a limited time.